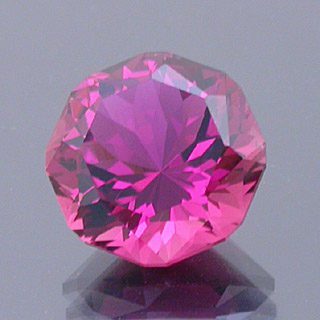 An outstanding tourmaline with a rich pink color and excellent brilliance. The cut is a sort of double barion octagon with clipped off corners and a sawtooth crown. This stone has some minor inclusions around the edges, but seems to face up eye clean even in bright sunlight. This one would make an impressive pendant stone! Comments: An outstanding tourmaline with a rich pink color and excellent brilliance. The cut is a sort of double barion octagon with clipped off corners and a sawtooth crown. This stone has some minor inclusions around the edges, but seems to face up eye clean even in bright sunlight. This one would make an impressive pendant stone!